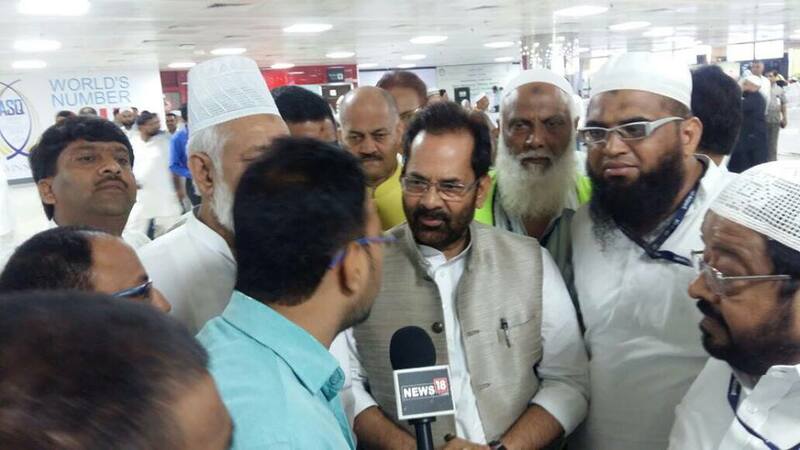 New Delhi: The Minister of State for Minority Affairs (Independent Charge) & Parliamentary Affairs Shri Mukhtar Abbas Naqvi today morning flagged off the first batch of 300 Haj pilgrims from New Delhi Airport with prayers of country’s safety and prosperity. Shri Naqvi congratulated to Haj pilgrims and extended best wishes to them for their pilgrimage. Shri Naqvi said that the Ministry of Minority Affairs, in cooperation with Haj Committee of India and other concerned agencies, had completed preparations for Haj 2017 well before in time to ensure smooth Haj pilgrimage. Saudi Arabia has increased annual Haj quota of India by 34,005. After significant increase in India’s Haj quota by Saudi Arabia Government, a total of 1,70,025 people have been going to Haj pilgrimage this year from India out of which 1,25,025 pilgrims will go through Haj Committee of India while 45,000 people will go through Private Tour Operators from 21 embarkation points. 1628 Haj pilgrims will go from Delhi. A total of 16,600 people will go from Delhi embarkation point which include Haj pilgrims from Haryana, Uttar Pradesh, Uttrakhand, Punjab, Himachal Pradesh and Chandigarh.